Today, we officially begin the journey of memorising the words of Allah swt. InshaAllah this journey will remain consistent and will not be interrupted by laziness and other distractions that come in this dunya. The reason why I had requested a few days for mental preparation was to really have this idea sink into my brain and accept the fact that bi'idhnillah ta'aala this will remain a life long commitment until we happen to reach the end or death comes our way. It's a pleasure to tread this path with all of you. Before we officially sail away, let us remember to think deeply about our intentions. The above is very relevant to this initiative. 1) We will split up into two pairs. Obviously you 2 brothers will be together and I will be with my sister. Each pair will have to hold each other to account on a daily basis. Encourage one another and be firm with each other if the aims for the day are not reached. 2) On a wider scale, obviously I will be holding all of us to account in terms of reaching the aims for the week. As your leader, I have to be treated a lot more strictly by you guys. I know I can come across as a bit laid back, but with the Quran, I will be harsh. We need to take this seriously and there will be no mucking around. There will be no toleration of lame excuses- excessive negligence may result in expulsion from this group activity. We all have to learn to balance all other activities in life along with this, bi'idhnillah ta'aala. 3) Let's all allocate a time during the day where we can take care of our hifdh. After fajr is always the best period during the day for any mental or physical activity. It's also the most tranquil time of the day. It feels amazing to be awake in contemplation while the rest of the neighbourhood is asleep . Since we are all taking part in the Ramadan eCircle, the tarbiyah part (i.e. sleep) of the initiative will certainly come in handy with this. I ask Allah swt to protect us from riyaa, to purify and to maintain the purity of our intentions and may Allah swt elevate our rank in jannah through our knowledge of the Quran, I pray that we will be able to stay consistent with this initiative, whether together as a group or separately as individual slaves of Allah. May we sacrifice sleep and devote our free time to studying and learning the words of Allah. May Allah grant us wisdom when memorising and trying to understand the Quran and may Allah grant us the motivation, taqwah and sabr to execute the commands of His book and to put into practice each verse that we learn. 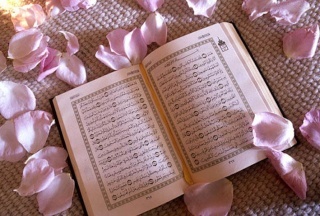 Finally, I ask Allah with all of my heart to allow us to experience the miracle of this Quran just once before we die. May Allah bless us with the privilege of understanding His book and may we cry the tears that soaked the cheeks of the greatest mujahideen and the most righteous people of the past, upon reciting the Quran. Ameen. Please share any tips or any interesting/relevant information that you may come across . InshaAllah I will put up the tafseer of the verses. By the way, is there a way of posting the arabic verses in here? Because they show up as weird characters when I paste it. and most importantly.. may Allah swt allow us to witness the day when we see these words not just in books or in our memories but in reality before our very eyes. On a wider scale, obviously I will be holding all of us to account in terms of reaching the aims for the week. As your leader, I have to be treated a lot more strictly by you guys. I know I can come across as a bit laid back, but with the Quran, I will be harsh. We need to take this seriously and there will be no mucking around. There will be no toleration of lame excuses- excessive negligence may result in expulsion from this group activity. We all have to learn to balance all other activities in life along with this, bi'idhnillah ta'aala. indeed thats the only way this will work. alhamdulillah, I think we're all sufficiently radical to realise the necessity of strict muhaasabah (accountablity). here are the verses you can get them from gawaher. JazakAllah for that and ameen to the duas . How are you guys going so far?